The Antietam (CV-36) was an aircraft carrier laid down on 15 March 1943 by the Philadelphia Navy Yard and launched on 20 August 1944. Asigned to the Japanese front during the last days of the WWII, after tree days out of Oahu, in route to the operations teather received word of the Japanese capitulation and the consequent cessation of hostilities. Thus, by the time of her arrival in Eniwetok Atoll on 19 August 1945, her mission changed from combat to occupation support duty. The aircraft carrier remained in the Far East for a little more than three years and by early 1949, she concluded her mission in the Orient and headed back to the United States for deactivation. Antietam remained in reserve at Alameda, California, until north Korean-Chinese forces invaded South Korea in the summer of 1950. She began reactivation preparations on 6 December and went back into commission on 17 January 1951 and arrived in the Far East later that fall and, by late November, began the only combat deployment of her career. During that tour, she made four cruises with Task Force (TF) 77, in the combat zone off the coast of Korea. During the following years she participated in numerous fleet and independent ship's exercises with 6th Fleet in Europe, with the Atlantic Fleet ASW forces. During the Suez crisis in the eastern Mediterranean helped the 6th Fleet during the evacuation of American citizens from Alexandria, Egypt. After resuming operations along the eastern seaboard early in 1957, Antietam was assigned on 21 April 1957 to training duty with the Naval Air Training Station, Pensacola, Fla. Mayport, however, served as her home port because ships of her draft could not then enter port at Pensacola. In May of 1961, the ship was transformed in the launching platform for stratospheric balloons, in the framework of the fifth and last mission of NAVY's medical research manned balloon program denominated "Stratolab". 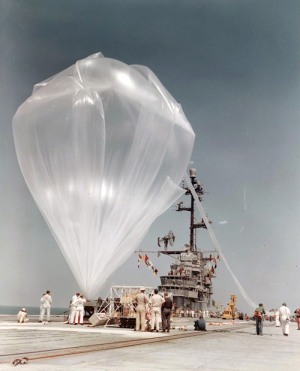 The launching campaign -wich included some previous test flights- began in April in the Gulf of Mexico near the mouth of the Mississippi River. The last launching of the series took place on May 4th, establishing the world-wide record of absolute altitude for a manned flight, today still oficially unbeated. On 23 October 1962, Antietam was relieved by USS Lexington (CVS-16) as aviation training ship at Pensacola and was placed in reserve, on 7 January 1963 until on 28 February 1974, she was sold to the Union Minerals & Alloys Corp. for scrapping.